At times very rarely you might think about hiding a blog post from your homepage. Let us assume that you are publishing an irrelevant material in your blog and that is to verify Technorati claim token. This becomes needless for your visitors, so just after verifying you are deciding to hide that post from your homepage. Or, an outdated article which still appears in your homepage or any post that is irrelevant to your blog topic. It can be any reason and any post that you wish not to show in your homepage can be easily hidden from your visitors. Don’t panic, we are not going to share any codes; Do you know that Blogger lets you to change the date of the published post. The trick is by back-dating the post you can simply hide it from your homepage, but which still appears in your older archives. That is the hidden post is available only for visitors who come via search engine and not for visitors who lands straight in your homepage. Let us see how to hide certain posts from Blogger homepage. 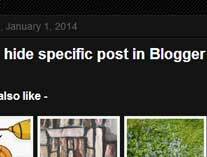 Login to your Blogger blog and go to posts >> new post or open up your previous post if you wish to hide that. Now in post editor that is in right hand side next below to labels you will see “published on” option. Just back date to something older, save it and then update your blog post. Go check on your blog’s homepage where you can notice that the particular post is hidden. Hope this helped you on how to hide specific posts from homepage in Blogger.